This is where library material is checked out and returned. It is located on the right, as you enter the library entrance. To check out library material, you will need a library card. 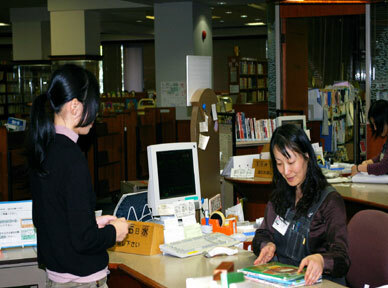 Your residence, place of work or school must be within the city limits of Fukuoka to qualify for a library card (you will be asked to either show your driver's license, insurance certificate or student I.D. for identification). 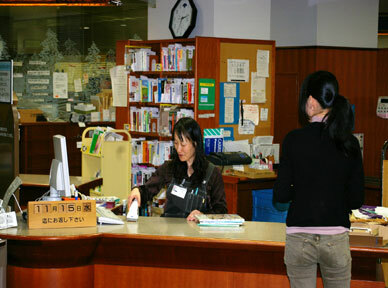 Library cards can be used at this main library and at any Fukuoka district library. However, library cards must be renewed every three years. Should you lose your library card, it will take about one week to get a replacement. Please return your library card should you move out of the City of Fukuoka. Excluding CDs, you may return library material when the library is closed by using the Book Deposit. Library material can also be returned at district libraries. Please be advised, however, that check out privileges may be suspended should checked out material not be returned within a certain period of time. Those with severe physical handicaps who are unable to come to the library may check out library material by mail.